Ser capaz de hacer preguntas y hablar de tiempo es fundamental para hablar cualquier idioma. Esta es una habilidad importante en la vida cotidiana, pero puede ser difícil de aprender. Entonces, en lugar de simplemente decir los números que ves en el reloj, puedes sonar como un nativo usando las mismas frases y términos que la mayoría de los hablantes de inglés. 1 ► 3:19 ???? It’s half past five. 2 ► 11:55 ???? It’s twenty-eight past seven. 3 ► 5: 30 ???? It’s a quarter past ten. 4 ► 8:10 ???? It’s five to twelve. 5 ► 7:28 ???? It’s twenty to two. 6 ► 10:15 ???? It’s nineteen past three. 7 ► 9:45 ???? It’s eight and ten minutes. 8 ► 1:40 ???? It’s a quarter to ten. 3) Selecciona la respuesta correcta. a) It's twenty past eight. b) It's four thirty five. c) It's forty past four. a) It's one fifty. .
c) It's ten past eleven. a) It's a quarter to six. c) It's twenty-eight past nine. a) It's five past one. c) It's five past twelve. b) It's three and a half. c) It's thirty past four. b) It's three past nine. a) It's seven and twenty-five minutes. b) It's thirty-five past five. c) It's seven and five minutes. 4) Contesta las siguientes preguntas de acuerdo al planificador. Escribe las horas en letras. a) At what time does Danny do his homework? 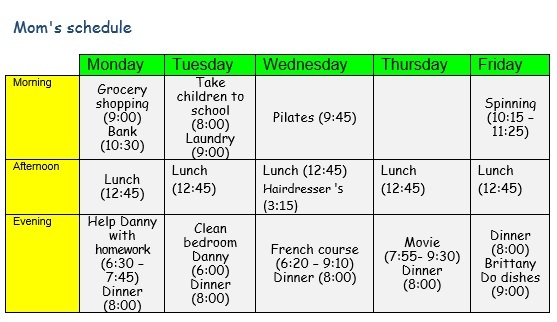 b) At what time is the Pilates class? c) When does the spinning class end? d) At what time do they lunch every day? e) At what time does the French course begin? f) What time is it when they have dinner? g) At what time will she be at the hairdresser’s? h) At what time does the movie start? 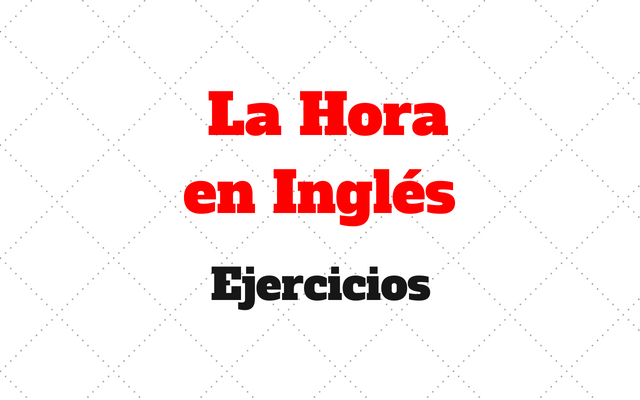 Terminan aquí los ejercicios de horas en inglés. Muchas gracias por su visita. Duolingo ¿Cómo funciona la aplicación web y Cuánto cuesta? Que es el verbo TO BE? 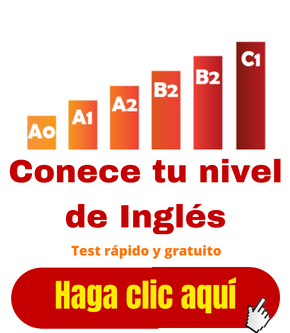 Cómo usar en Inglés? Con Ejercicios!